The subject of the latest in our series on literary figures and silent film is unusual in that his significant engagement with film preceded his first book publication. Evelyn Waugh was twenty-one, had just come down from Oxford, and was working on a novel, The Temple of Thatch (which was never to be completed), when he became involved in films. Try and bring home thoughts by actions and incidents. Don’t make everything said. This is the inestimable value of the Cinema to novelists (don’t scoff at this as a cheap epigram it is really very true). Make things happen. … Whatever the temptation, for God’s sake don’t bring characters on simply to draw their characters and make them talk. Fit them into a design. … It is a damn good idea. Don’t spoil it out of slackness or perversity but do MAKE THINGS HAPPEN. Have a murder in every chapter if you like but do do something. GO TO THE CINEMA and risk the headache. Waugh found inspiration in films not for pictorial values as such, but in what he saw films could offer in terms of narrative design and continuity, of montage, propulsion, and changing fields of vision. Moreover, Waugh the satirist was inspired by film’s propensity for exposing falsity through display. As George McCartney (in Confused Roaring: Evelyn Waugh and the Modernist Tradition) puts it, ‘the medium’s peculiar perceptual qualities seemed to express just those unquestioned assumptions of his age that he most wanted to satirize’. Waugh would first experiment with filmic devices in his fiction in the 1926 short story ‘The Balance’, which uses scene directions and titles in the manner of a silent film, but before then he had engaged directly in exploring film’s potential to expose human folly. After ‘The Cabinet of Doctor Caligari’ had been shown in our city there was only one topic of conversation at gatherings of the Aesthetic individuals for several weeks to come. Finally undergraduates began to turn to the big task of film-production itself. Various nomadic groups made several vigorous little burlesques, negligible from the point of view of artistic quality, but capable of raising a good laugh in the University clubs wherein they were shown – and at any rate films. One of Greenidge’s films does survive, however: The Scarlet Woman: An Ecclesiastical Melodrama. As the titles of the lost films indicate, religion was a favourite target, and for The Scarlet Woman Waugh provided the scenario, as well as acting in the film. It is a ribald satire on the Roman Catholic church, concerning as it does the attempt of the Dean of Balliol to convert the English monarchy to Catholicism. 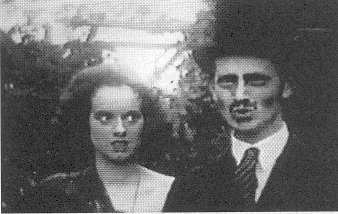 Waugh was of course to convert to Catholicism just a few years later, which gives The Scarlet Woman a particular piquancy, the final rebellious assault of one more drawn to the religion than he knew. With £6 put up by each of the leading performers to finance the production, filming started in July 1924 and lasted largely until September, though the film was not ready for showing until November 1925, when it received its premiere in Oxford. We know a fair bit about the film’s production, from Waugh’s autobiography A Little Learning and the diaries, where he wearily records that he was quite disgusted with how bad it was. However, such disdain has an air of show about it: in A Little Learning, his brief account of the film’s production does refer to ‘the fun of our venture’, particularly noting his father’s delight in the amateur theatrical nature of the filming, recognising his own possessions being used as props. In the film Waugh acts his two parts with gusto. He plays the Catholic Dean of Balliol, a real figure of Waugh’s acquaintance whom he had come to despise, depicting him as a blonde-wigged homosexual with designs on the Prince of Wales; Waugh also plays the impecunious peer Lord Borrowington. Other performers John Sutro as Cardinal Montefiasco, Waugh’s writer brother Alec Waugh, as the cardinal’s drunken mother, Lord Elmley as the Lord Chamberlain, Guy Hemingway as the Pope, John Greenidge as the Prince of Wales, and Terence Greenidge as a Jesuit priest. 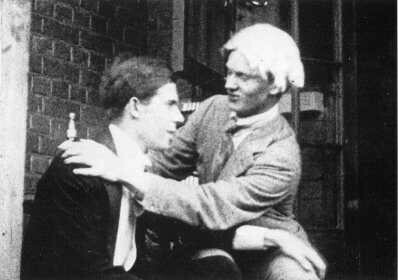 The film was first shown at the Oxford University Dramatic Society, where the future composer Lennox Berkeley provided the music accompaniment with gramophone recordings. A second screening was requested by the Society of Jesus at Campion Hall. Showing that the Catholic Church could take a joke, Father C.C. Martindale sanctioned a subtitle that remains on the print: ‘Nihil Obstat – projiciatur – C.C. Martindale SJ’. It was only ever shown among friends and private groups. Greenidge retained a copy, exhibiting it from time to time, and it resurfaced in the 1960s and is now preserved by the BFI National Archive. The Scarlet Woman (which runs for 45mins) is both a juvenile jape, and an extraordinary window into the evolution of a satirical mind. Elsa Lanchester’s fevered performance raises it to a level that sometimes matches its pretensions, and makes it watchable today. It is an amateur film in perfomance, costumes, sets, picture quality and so forth, but judged on its own merits it has survived remarkably well. Waugh published his first novel, Decline and Fall, in 1928, and became a Roman Catholic in 1930. In the 1930s he worked for a time for Alexander Korda writing film scenarios (of which the title Lovelies from America indicates the wild improbabilty of any of Waugh’s work ever being produced). He was never involved in film production again, but offered a vicious satire of Hollywood life and the American way of death in his novel The Loved One. More information on the film’s production can be found on the Evelyn Waugh Newsletter vol. 3 no. 2 (1969), which has much information on its rediscovery in the 1960s and records all of the intertitles, and on the Evelyn Waugh Newsletter and Studies vol. 33 no. 2 (Autumn 2002), which has a detailed description of the film’s action. Both are available online. The Scarlet Woman is available on DVD from Charles Linck, P.O. Box 3002 TAMU-C, Commerce, Texas 75429, USA, email linck [at] tamu-commerce.edu (earlier VHS copies were transferred at sound speed; the DVD corrects this). It can also be seen for free by anyone passing through London at the BFI Mediatheque on the South Bank. I’m searching for the source to the quote in which Evelyn Waugh exhorted friend Dudley Crew to write cinematically. Can anyone produce a reference for this quote? It comes from a letter from Waugh to Dudley Carew, January 1921, in Mark Amory (ed. ), The Letters of Evelyn Waugh (London: Weidenfeld and Nicolson, 1980), p. 2. Having recently read Waugh for the first time, and being a big cinema buff, this was some fascinating information. Thanks! There have been several reports of frustration with the streaming of the Europa Film Treasures site films, no matter what people’s connection. One answer is to be patient and allow the entire film to load. The other is to download the latest version of Flash. I have Flash 9, and with a broadband connection I’ve had no problem running any of the films. Microsoft’s Live Search was taken down just a few days after I wrote that enthusiastic post. Apparently they decided not to go head-to-head with Google on book digitisation. There was plenty of overlap with other resources i.e. a lot of the books remain available on the Internet Archive, but Live Search itself was a rather good search-and-find tool, and it’s a pity to have lost it.